For each type of true bred poodle– miniature, signature, and toy– the fur is single layer. This may not be true of poodle mixes, so if you have a golden doodle or something similar, talk to a groomer about your dog’s differences. For single layer fur, matting can be an issue if you neglect hair care. Just because your poodle doesn’t shed does not mean you can be lax in hair care. Because poodles require such frequent trims, going to the groomer each time is costly. There are a number of products you can use with your poodle that are simple to operate. The type of clipper that best suits you depends on what kind of cut you want for your poodle. Below are the top three options, pick and choose what works for you and your poodle. The highest recommended clippers on many different product websites and blogs are the Andis Proclip 2 Speed Detachable Clippers. These clippers have a lasting charge and can be adjusted to whichever speed suits the haircut you choose. If your dog is sensitive and jumpy about grooming, this is your best option. It’s a high cost but a worthwhile investment; think about how much you will be saving by avoiding the groomers! If you want a clipper with even more speed options, look at the Andis Excel Pro-Animal 5 Speed Kit. It’s more expensive, but provides more options to help you clip around sensitive areas and meet whatever finish you are looking for on the fur. You may hear other poodle owners recommend the Oster to you, but it’s more expensive and runs hotter. The Andis clippers are more user-friendly and a better return for the price. Lastly, if you need a more affordable option, the Wahl 5 Cordless Detailer is a quality choice. It’s great for beginners and easy to use on your poodle’s facial fur. Many professionals use it because it holds its charge for so long. Whether you heed these suggestions or not, be careful to make your purchase based on your experience level. A ten-inch blade is the best starting point. Once you get used to your clippers, you can play around with length. Here is a list of poodle styles so you know the fur length you are going for. 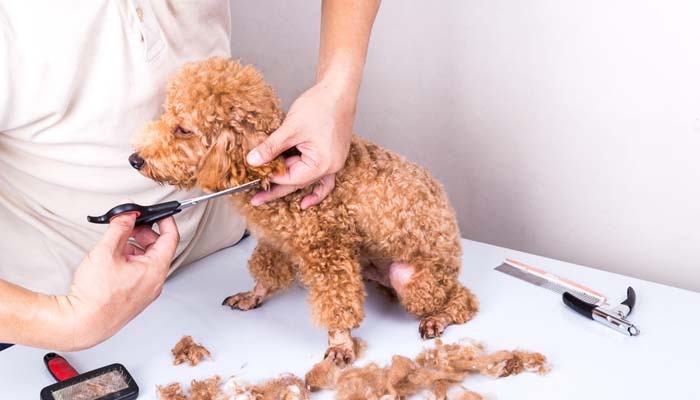 These clippers are user-friendly and may leave you feeling confident about trimming fur, but remember the hard to reach areas like between the toes, around the nose and eyes, and styling the tail and their head and facial fur. Do not trim these blindly; watch a series of videos to help you navigate these difficult spots. Browse whichever products work for you, and do your research on your fur cut of choice to make sure you style it evenly. Once you get the hang of trimming, you can take your groomer off of speed dial! Your poodle will be the star of the dog park.